Think of the new Honda AquaTrax F-15 as a little less. A little less performance than the F-15X Honda debuted in 2008, for a little less money. With the exception of the engine and the brilliant Candy Orange color, the AquaTrax F-15 is identical to the F-15X we tested last May. The F-15X is powered by a 1.5-liter four-cylinder engine boosted to 197 hp by a turbocharger/intercooler combo. The new F-15 has the same engine but without the turbo, rated at 153 hp. 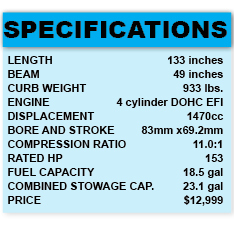 Compression ratio is increased from 8.5:1 to 11.0:1, and by discarding the turbo apparatus the curb weight of the F-15 drops 28 pounds, to 933. 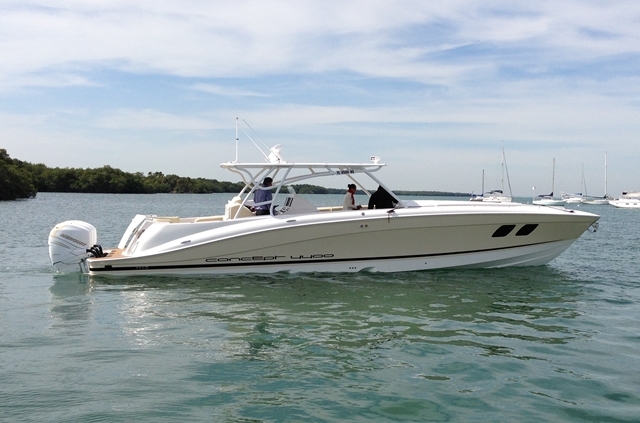 This engine requires premium-grade fuel, which not only nicks you in the wallet but sometimes can be hard to find on the water. Its new Candy Orange deck dazzling in the sunshine, the Honda F-15 zips to a top speed of about 57 mph and tracks a true course in any water condition. The net result is a slight loss of acceleration performance, though hardly enough to detect through the seat of your wetsuit, and a dip in top speed, from about 65 mph to 57 mph. The savings? At $12,999 the F-15 is priced exactly $1,000 less than the F-15X. Which should buy gas for a season or two, but is hardly a bargain. 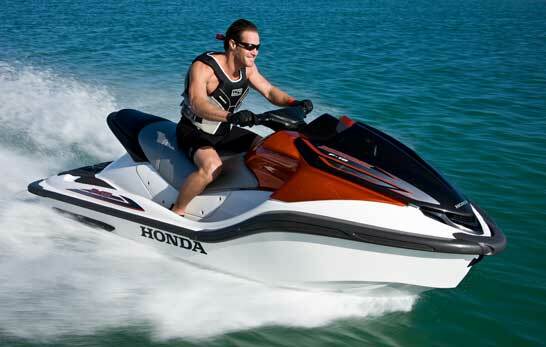 Consider that the 155-hp Sea-Doo GTX 155 can match the top speed of the Honda F-15, and is priced at $10,699. 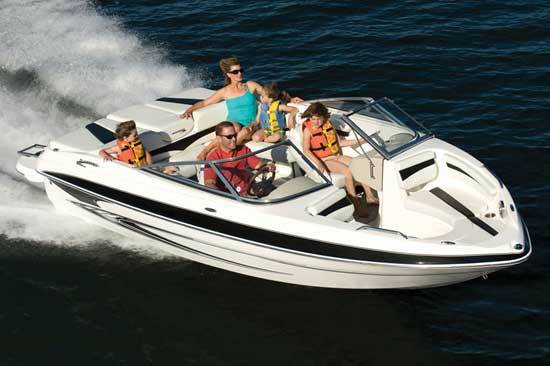 The 180-hp Yamaha FX HO delivers 62 mph for $11,399. Something to think about in this economy. But here’s what I like about the Honda F-15: it delivers sporty handling that is also predictable and family-friendly. The throttle response is smooth and linear, meaning that there are no peaks or sudden “hits” in the powerband that might make the F-15 a poor choice for towing. The ride is soft and usually dry. In other words, like the F-15X, the Honda F-15 offers something for everyone. 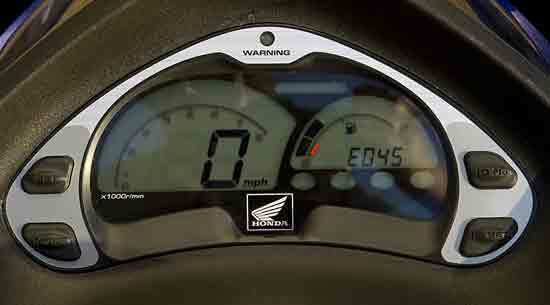 It also has one gizmo that I love, a “time to ride” display on the digital instrument panel. The engine computer notes the fuel tank level and the real-time fuel use, and calculates how much longer in minutes the F-15 can be ridden at its present speed before it runs out of fuel. This is much handier information than a simple fuel-flow meter reporting gallons per hour. Last month I rode with Honda rep Tim Patnode from the Port of Los Angeles to Catalina Island and back, a round trip of about 52 miles, using both the Honda F-15 and the F-15X. We swapped boats several times during the trip, so it made for a great back-to-back comparison. It was also a chilly, blustery day that gave me a good chance to evaluate this hull in some rough water. With the exception of a few blasts of full throttle just for the sake of science, conditions limited us to a comfortable speed of about 35 mph, so the extra power of the F-15X was irrelevant. 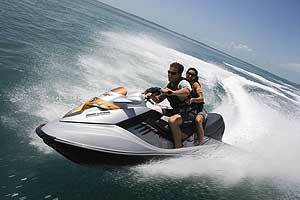 And unless you ride in an area where you can frequently use full-throttle, the extra power is really a luxury. Consider that $1,000 again. The F-15 did feel a little lighter and thus less tiring under me as we banged along through the chop and swells. The hull tracks well in any sea condition, another attribute that lessens fatigue on a long ride. 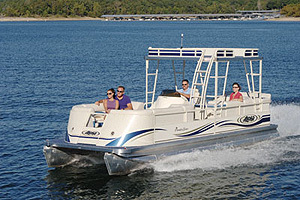 Neither boat has adjustable handlebars, and anyone approaching six feet in height will likely find the bars are too low to be comfortable for long when riding while standing in rough water. I get too much pressure on my wrists. The ergonomics when sitting are great, however. The seat is supportive and held me in place. 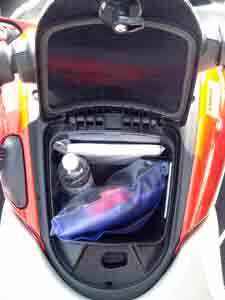 Call it a glove box or cowl stowage, this space is big enough to be truly handy. The thick gasket and sturdy latch keep it bone dry on the sloppiest days. In these conditions, taking some spray to the face was inevitable. But when we unloaded at the end of the day, I noted that both the bow stowage compartment and the glove box were bone dry, as was the engine bilge.The glove box is also a nice size, big enough to hold my camera, GPS and notebook in a small dry bag, with room left for a water bottle and a wallet. The bow compartment is not huge, but big enough to hold all the gear we packed for an open-water day trip, including some small fenders. For this premium price, you’d expect the quality to be top-notch. 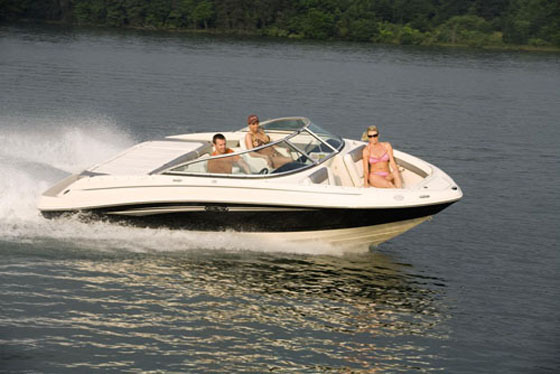 I can’t comment on long-term durability from a day-trip, but the materials used on this boat all seem to be first-rate, the fit and finish is outstanding. The AquaTrax F-15 may be a little less from Honda, but it’s still a great machine. Editor’s Note: Charles Plueddeman, our Outboard and Trailer Expert, is a former editor at Boating Magazine and contributor to many national publications since 1986.